We have heard about dog whisperers who control the dog by whispering into their ears. It is not always easy to find a good dog whisperer. And you have to be wary of amateurs because they can do much more damage than good. Like any budding life, the first few years are formative. Dogs are no different. Also doing it yourself, if you are new to the dog world and its shenanigans, can be quite taxing and well you would lose a ton of time. So you have to do your research and meet up with different trainers or dog whisperers and see who can fit your and your dogs’ needs. The training for a dong is nothing but to bring out the talent of the dog and make him work as per the commands of the owner so that it can be easy for the dog as well as the owner to have a perfect companionship. The training of the dog depends on numerous factors such as type, breed, age, and environment. The training to a dog for domestic purpose and military purpose differs, and hence their schedule of training, as well as intensity, also differs. Usually, for a common man, domestic training is sufficient where the dog can do some routine jobs effectively with the help of the training. There are various dog training techniques used by the trainers for effective training. Why Solely Dog Training Programs? Strengthening the relationship between the human and their companion, this is the main motive of the dog training programs. When people buy a pup or take in a dog, the first few concerns, especially with a slightly elder dog, is that you would find yourself asking the question, ‘Will he obey me? Will he be able to learn a new?’. Many dogs are in need of shelter, and there are many people who would like to adopt even elder dogs. It is not so much that you can’t teach old dog new tricks, it is just harder. This is where these training programs come in handy. 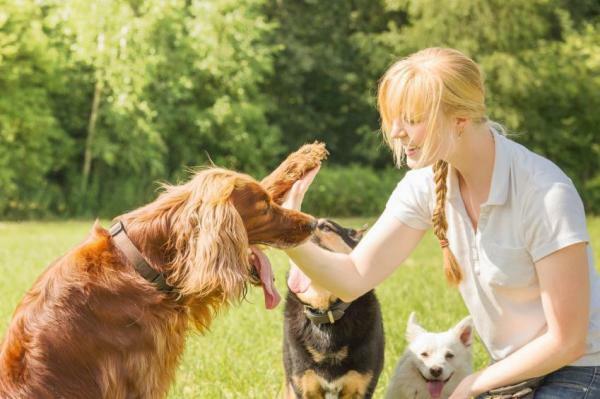 Not only do they train, they also help in other activities like giving proper attention to the dogs that would need special help for exercising. These training centers don’t just train dogs to better behavioral patterns but also train dogs to be athletes! They train dogs for protection and security purposes, behavior modifications, obedience management. They also provide in-home or park sessions. Every dog training program is different and caters to different needs. It is different for a soldier training a dog, and for you if you are bringing a new pup home. Also, come into factor your lifestyle, the number of hours you spend with your dog, and primarily how your relationship with your dog is. Alpha and Omega Dog Training offers programs like Proper Puppy Program, Behaviour Modification, Managed Obedience and the like. It is imperative that you understand why you would want to cater to a specific program, and by the same token, it is essential to understand what training you are looking for your pup or dog. There are indeed some programs where if you do not get 100% satisfaction, your session is free. It is a win-win situation for owners. Visit over fogut.com for dogs natural remedies.